1. Preheat oven to 350°F (180°C). Line 8-in. (20-cm) square baking pan with parchment paper. 2. Melt chocolate in microwave on HIGH in 30-sec. increments, stirring after each time until smooth. Cool 5 min. Meanwhile, sift cocoa powder, flour and salt into a large bowl. Set aside. 3. Combine avocados, eggs, sugar, vanilla extract and melted chocolate in food processor. Blend until smooth. 4. Pour avocado mixture into cocoa mixture; mix well. Scrape into prepared pan, smoothing top. Bake 20 to 25 min., until just set. Cut into 12 pieces to serve. 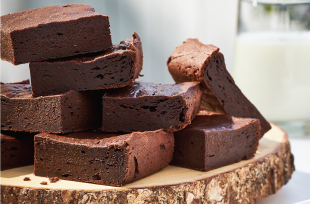 Tip: For gluten-free brownies, replace all-purpose flour with coconut flour.